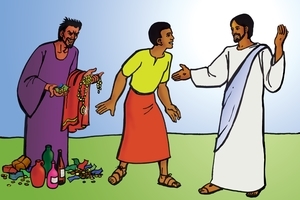 Outline: Simpler version of #61 "How to Walk Jesus' Way," but it mentions things that hurt the body such as betel nut, hemp, alcohol; and God's standard about having one wife. Are you already a believer in Jesus? Would you like to know what He wants you to do? In the Bible, God teaches us what to do. He says He wants us to pray to Him every day. Pray in the morning when you rise. Pray at night before you go to sleep. You can pray in your heart while you are working, and when you are walking from place to place. Always pray to God in Jesus' name. Love God with all your heart. Love your neighbors as much as you love yourself. Teach your children about God and, if possible, take them to meetings of worship. Pray with others who also love Jesus. (Learn all you can about God's Book, the Bible). Try to show your friends and relatives the right way to God through Jesus Christ. God says His children should never tell lies or steal. You should be honest. Work with your own hands, and provide the needs of your family. If you have stolen anything, take it back or pay for it. If you trade (sell) anything, measure very carefully. Never cheat anyone. God's way is good only. Be ready to help others. Be good to your brothers and sisters in Christ. Help provide the needs of God's servants who teach you God's Word. When you do this you are giving to God. Don't be jealous or angry. If someone treats you badly, be good to them. The love of God will be in your heart. Jesus loved us and gave His life for us even when we were sinners. He loved us when we were His enemies. Don't do anything that will hurt your body. Your body now belongs to God. Keep it clean. Do you think that you should keep on using drink (alcohol) and tobacco (hemp, betel nut) and other things that hurt your body? Your body is God's house. Is it hard for you to stop doing these things? Ask Jesus to help you, and His Holy Spirit Who lives in your heart will give you strength to obey God. You should have just one wife, and not want any other woman. Teach your children to obey God, and to obey their parents. Give thanks to God for your food. Be thankful for all things, because God is caring for you, and bringing to you what is good. Don't be fearful. God is your Father. He has more power than all evil spirits and everything in the world. Trust Him and He will protect you. When you have any kind of need, talk to God in the name of Jesus, and He will hear you. Wherever you go, tell others about Jesus, so they also will believe on Him. GRN has recorded a version of this script in 325 languages and dialects. See full list.